I’ve been a homemaker for about seventeen years now. It’s always been my heart’s desire, so it’s really a dream come true for me. Has it been easy? No. Have there been challenges and difficulties along the way? Of course. There have been times when homemaking was so difficult that I felt like I just couldn’t make it. These were times when I was suffering with severe morning sickness and taking care of toddlers at the same time. And the years when I was struggling with Lyme disease and adrenal fatigue. And the times when we were dealing with unemployment. I have friends who have dealt with marital struggles and other issues while trying to manage a home at the same time. Homemaking through physical and financial difficulties is hard. I’m not going to pretend like it’s always easy, because it’s not. But the question is, is it worth it? Does homemaking really matter anyway? In order to keep going through the tough times, you must have a vision. You must know why you’re doing something in order to stay faithful during the hard days. I find this very motivating. To think that future generations are affected by what I’m doing in my home today helps me to keep an eternal perspective and try to be faithful. Many years ago, someone shared with me that the Christian life can be distilled down to two simple truths: love God, and love people. Everything we do in our day should be aiming toward the fulfillment of those two objectives. It may seem like something as simple as cooking a meal, cleaning the toilet, or wiping a runny nose has no eternal significance—but if we’re doing everything as if we’re doing it for Jesus, even these small acts of service can have profound meaning. When we take the time to make our family’s favorite meal, put away a pile of clean laundry, and make sure there is a sense of peace and order in our home, this is nurturing relationships in our family. It’s telling the people who live here that they are important and that we love them. It’s also a way to show love and build relationships with those outside our family, as we extend hospitality to others. Ponder that truth for a moment. 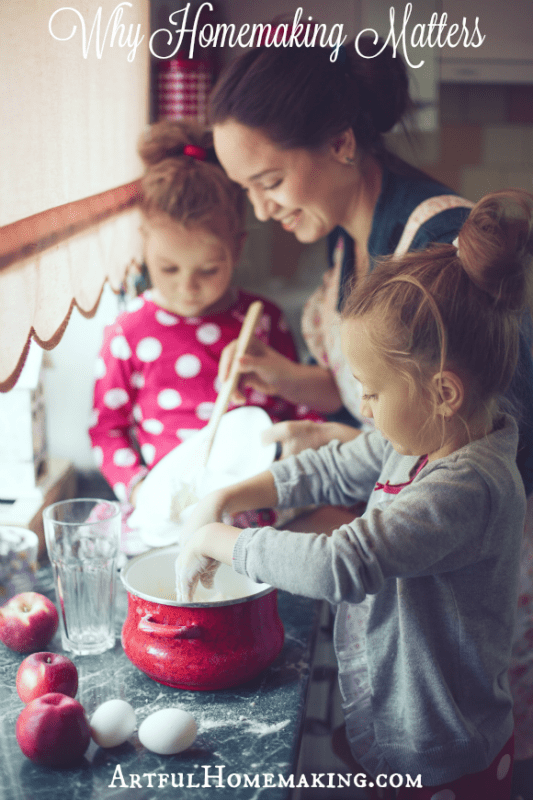 Can homemaking really be an expression of love? Of course it is! The act of making a home is an act of loving service. All of those seemingly mundane tasks that go into making a home are profoundly meaningful when done as an act of love for your family. This is the inspiration I need to carry on and finish strong as a wife, mother, and homemaker. My goal is to show forth the love of Jesus to those who live in our home and to anyone who would enter as a guest. My desire is that our home would truly be the happiest place on earth! And homemaking plays a huge part in this. So what really matters? Well, housework, among other things. It is not the only thing that matters, but it does matter. It matters that people have somewhere to come home to and that there be beds and meals and space and order available there. 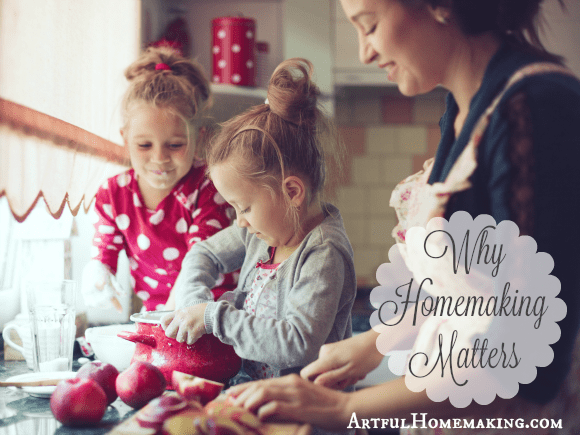 So, yes, homemaking matters very much. It matters to those who live in your home, and also to those who visit your home. Even if you’re only keeping house for yourself, it still matters. Don’t lose sight of the importance of your ministry as a homemaker. Your work matters! I love homemaking (and homeschooling)! I see the home as the perfect place for training and transferring your personal history to your kids. It’s in the context of a shared life that the moments that matter happen. Can’t substitute anything for just plain old T-I-M-E! I have found your website via Pinterest in a day in which housework and all the family were very heavy to my heart (not to mention the joints). And since I was asking the Lord to help me about this heaviness, I have to suppose that my coming here is not a coincidence. Thank you, Joy, and merry Christmas! So glad you stopped by, Umberta! I hope you had a lovely Christmas! Thanks quote from Sally Clarkson is so inspiring! Thank you for sharing, Joy! Sally never fails to inspire me! Thanks for stopping by, Jamie! ok, so ive been a banker for the past four years but my family has suffered from my lack of no time and trying to make ends meet, my daughter especially has suffered my absence, with that i have made up my mind to drop it all and be a good wife and loving mother to my children. your post was really encouraging. I’m so glad it was encouraging! I see homemaking as 'making your home' safe, secure, warm and healthy. It is a precious gift and honor for you to be able to stay home and make your home a place of peace. We have been married 42 years and I have been a home maker for at least half of those years then I went to work and now I am back into my home. I love it. it is peace. I agree, it is a precious gift! So thankful for it! I am not a wife or mother, but as the sister to ten other siblings I understand the value of homemaking. Not only is it important for the family, but in the event of hospitality as well. Thank you for sharing your heart on this! Beautifully written! I have been a stay at home mom for 7 years now to 3 little girls and I always say the days are long but the weeks are short! Time goes so fast, but it is so worth it at the end of the day! Thank you, Carole! I agree with your statement about the days being long but the weeks being short. It really does go by so quickly, but it's so worth it! This article was so encouraging. The quotes you used are beautiful. This is the kind of article that really helps homemakers when the days get difficult. What an inspirational post. I've struggles with not feeling valued as a homemaker. Not by my husband or kids, but by outside people. They think all I do is watch tv and my life it so easy. It hurts when people say those things to me. I wish I could share this post with those people. Thanks for writing such a great post. Amazing and so true! I can remember being in second grade wanting to be a teacher and homemaker- and I do both in our home! I wish more people, specially women, understood the value of a homemaker. It's not demeaning and shackling, it's gift from God! It's a blessing that will continue to touch others long after we're gone. Like ripples on a pond, our work, dedication and love magnify exponentially. So cute. I love everything about this post. Looks like fun! Joy , your post is full of golden words for a homemaker like me! I am a stay-at-hone daughter now, learning how to be a keeper of the home. I pray often that the Lord will bless me with the focus to stay on this path. There is no greater responsibility or gift than a woman caring for her family. As you said, the woman can change the world for future generations by her kindness, compassion, and self-sacrificing love she offers her family. Thanks for an amazing post. Thanks so much for sharing these encouraging thoughts, Lexie! One of my favorite quotes is from Mother Teresa : "If you want to make a difference in this world, go home and love your family".